Ethos Snowboard is simple, smooth and so much fun. With its easy-riding Rocker System and soft and forgiving flex, the Ethos is a stable and user-friendly board perfectly suited to beginner through advanced riders lookin' for a good time anywhere on the mountain. Complete with clear windows in the base and topsheet for a view of Arbor. S sustainably sourced, playful Single Malt Core, the Arbor. Ethos Snowboard embodies value, durability and fun. The Rocker System combines a progressive parabolic arc rocker profile with a tri-radial Grip Tech sidecut design. Enjoy more natural and cleaner tracking turns with a high performance surfy ride. 1 = Soft, 10 = Stiff. A tri-radial sidecut design that is not blended. Natural shaping intersections, that in the past were eliminated, have been transformed into heel and toe contact points that provide a direct, more ergonomic way to grip the snow when additional control is needed. All-mountain function in a range of snow conditions. A shorter tail than nose gives this board a slightly setback feeling keeping the board on top of the snow and perfect starting point for progression. Arbor's standard wood core, made from 100% sustainably grown poplar for highly reliable return and long-lasting durability. A biax over biax lay-up that's designed for park and street inspired all-mountain riding. Also creates a good platform for learning. A 360°, fully wrapped sidewall that eliminates the need for tip fill, while effectively tying the whole snowboard together. A technology that delivers incredibly tight tolerances for improved board life and durability. A tough, user-friendly extruded base that delivers lighter-weight performance. See-Through Windows in Topsheet and Base. Thank you for shopping with us. 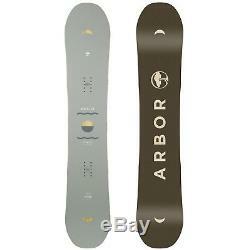 The item "Arbor Ethos New 2019 Snowboard Size 147" is in sale since Sunday, November 18, 2018. This item is in the category "Sporting Goods\Winter Sports\Snowboarding\Snowboards". The seller is "buyboards" and is located in Whitehall, Pennsylvania. This item can be shipped to United States, Canada, United Kingdom, Denmark, Romania, Slovakia, Bulgaria, Czech republic, Finland, Hungary, Latvia, Lithuania, Malta, Estonia, Australia, Greece, Portugal, Cyprus, Slovenia, Japan, Sweden, South Korea, Indonesia, Taiwan, South africa, Thailand, Belgium, France, Hong Kong, Ireland, Netherlands, Poland, Spain, Italy, Germany, Austria, Israel, Mexico, New Zealand, Philippines, Singapore, Switzerland, Norway, Saudi arabia, Ukraine, United arab emirates, Qatar, Kuwait, Bahrain, Croatia, Malaysia, Brazil, Chile, Colombia, Costa rica, Panama, Trinidad and tobago, Guatemala, Honduras, Jamaica.